One of the most popular royal palaces in London is Hampton Court. No royal lives there and it is not within Central London. Nonetheless, because of its associations with Tudor England, its architecture and its extensive gardens, it attracts half a million visitor each year. Hampton Court began as a private residence. In 1514, Thomas Woolsey obtained a lease on the site from the Order of St. John of Jerusalem. The next year, he became a cardinal and Lord Chancellor of England. The young King Henry VIII did not have much interest in government and so Wolsey became very powerful and amassed a great fortune. As a result, he built Hampton Court to rival or exceed any residence in the kingdom. When Henry VIII wanted to dispose of his first wife in order to marry Anne Boleyn, he turned to Woolsey as he had always done in the past to find him a way to do what he wanted. Woolsey, however, failed in this task and so his fortunes began to sink. 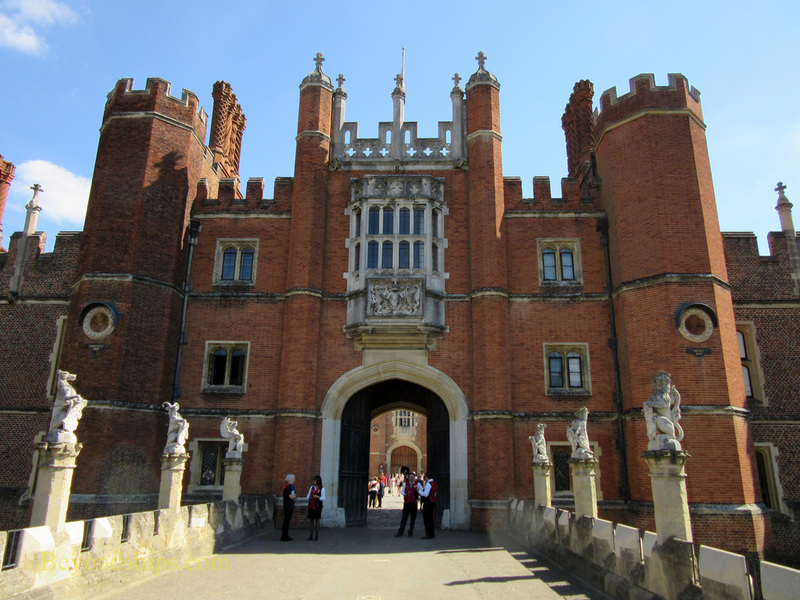 In an effort to return to royal favor, he presented Henry with the magnificent Hampton Court Palace. But it was to no avail. The King ordered Woolsey arrested for high treason and confiscated all of his property. Woolsey only escaped execution by dying of natural causes when he was being taken to London under arrest. Today, the vast palace is arranged to reflect three eras in its history - - the reigns of Henry VIII; William and Mary, and George II. The rooms devoted to each period are decorated as they would have been in that period. Along the same lines, the tour contained in the audioguide is divided to reflect the different periods. Because the palace is so large, many visitors elect to explore only one of the three. However, all three can be seen in a day. 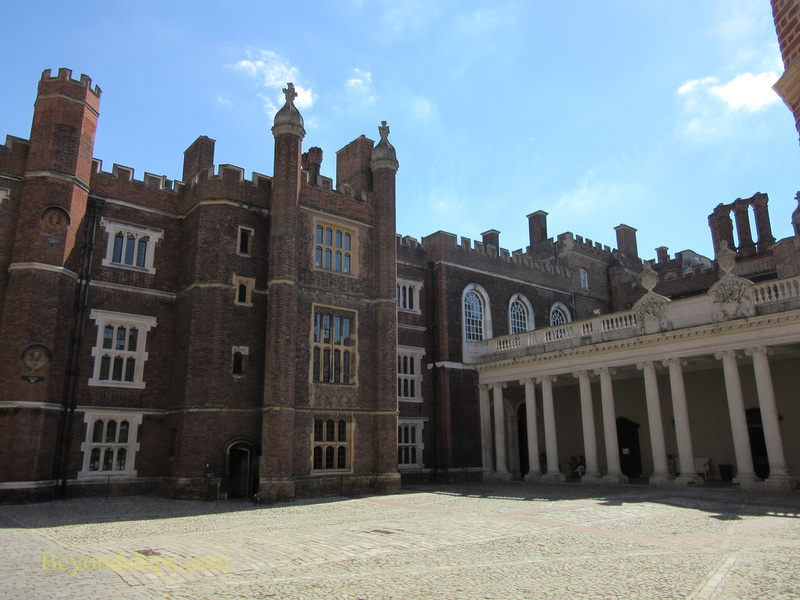 Upon acquiring Hampton Court, Henry VIII decided to expand the palace and make it even more magnificent. The Great Hall, with its hammer bean roof, was one of his additions. Henry brought five of his six wives to live here and his son, the future Edward VI, was born here. It was his favorite residence and he used it both as a pleasure grounds and to impress foreign dignitaries. One episode in Henry's reign with ties to Hampton Court involves the King's fifth wife, Catherine Howard. Although only 16 when she married Henry (then 50), Catherine had already been sexually active with another man. She also carried on an affair after she married Henry with Thomas Culpeper. Both of these deeds were deemed high treason and Catherine was condemned to death. While at Hampton Court, she broke loose from her guards and ran to the door of the Royal Pew, screaming for Henry who was inside. She was apprehended before reaching the King. According to legend, her ghost still runs shrieking down the Haunted Gallery. 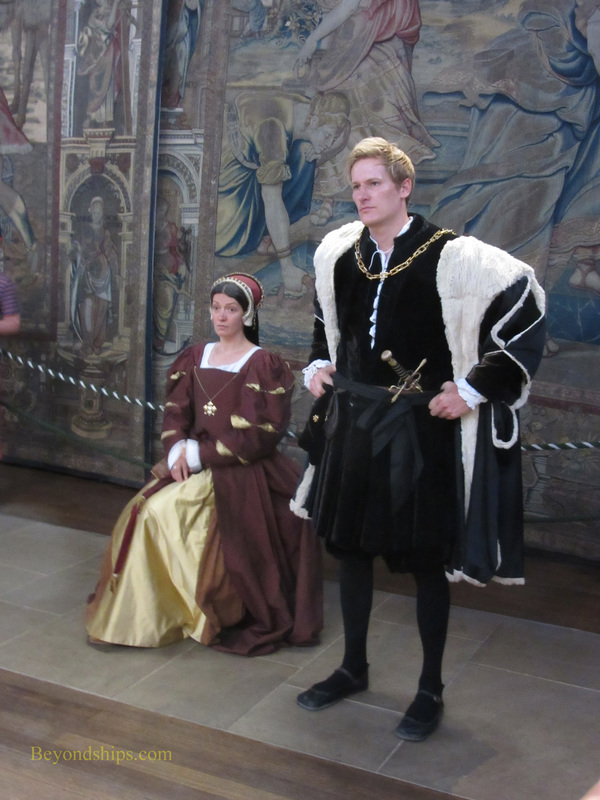 Costumed characters re-enact other incidents from the downfall of Queen Catherine Howard in this section of the palace. Along the same lines, the audioguide has an option in which you can be guided through the Henry VIII section of the palace by a member of the King's household. 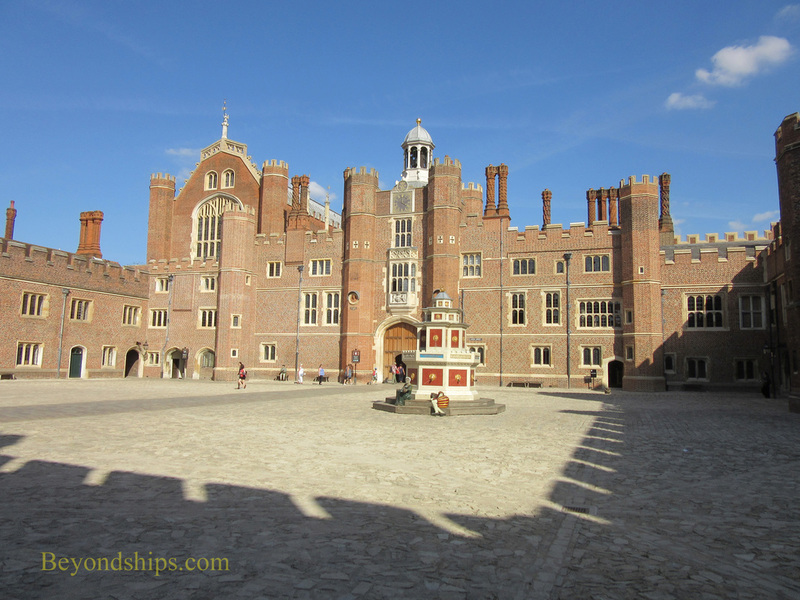 This imaginative tour takes you back to the day when Henry married his sixth wife, Catherine Parr. In addition to viewing the rooms where the royals and nobles lived, visitors can also view the below stairs world of Henry VIII's time. This includes the great kitchen and the cellars. Demonstrations such as roasting a beef over a roaring fire are also presented here. The Palace is built around courtyards. When you enter through the main gate, you arrived in the Tudor Base Court (above). The Clock Court (below) combines Tudor and Georgian elements. 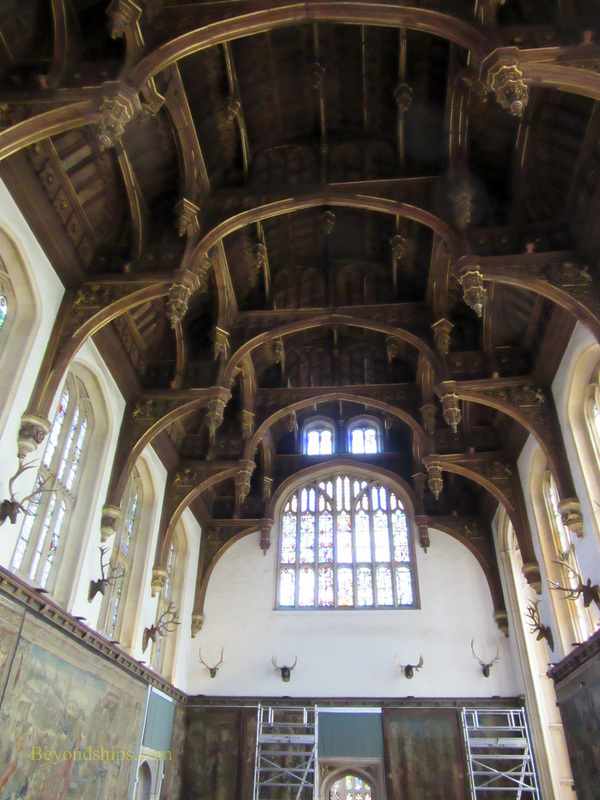 ​Above: The hammer beam ceiling of Henry VIII's Great Hall. Below left: Actors in period costume bring the palace to life. 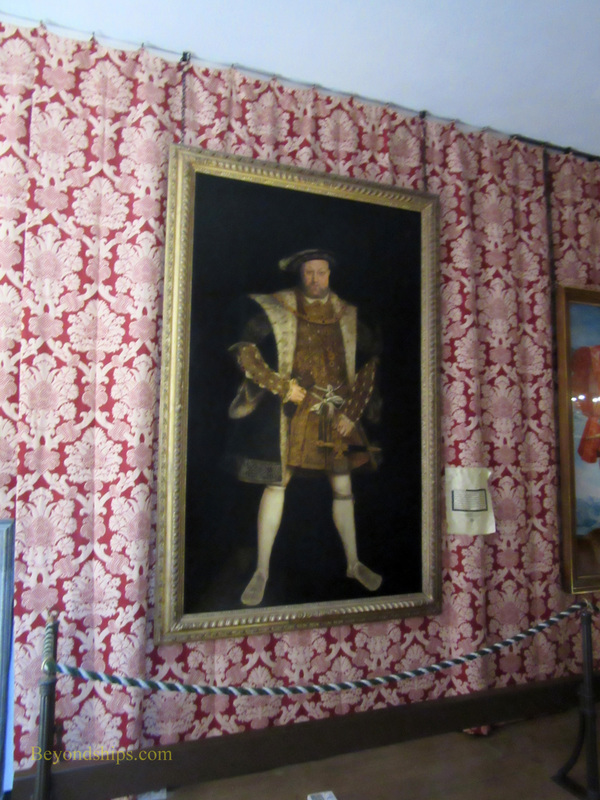 Below right: King Henry VIII still keeps an eye on things. 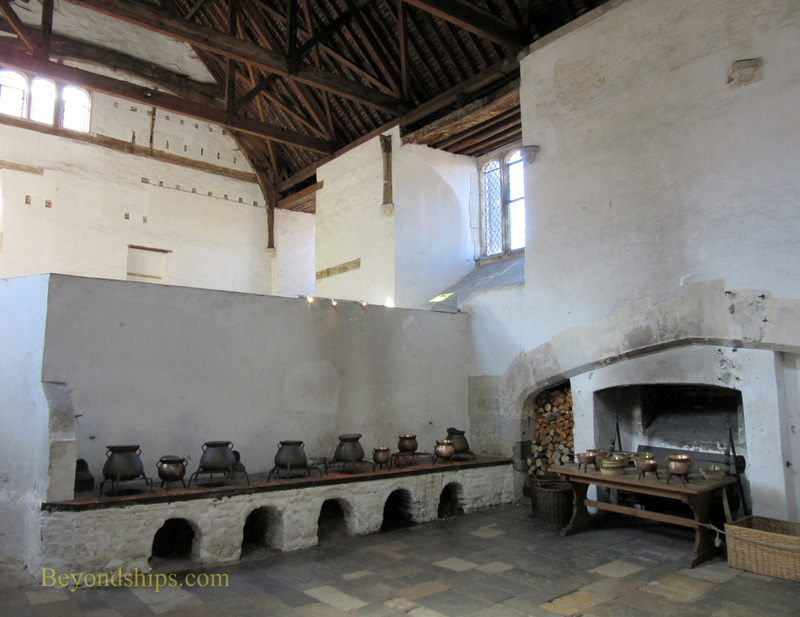 Above: Part of the Tudor kitchen.